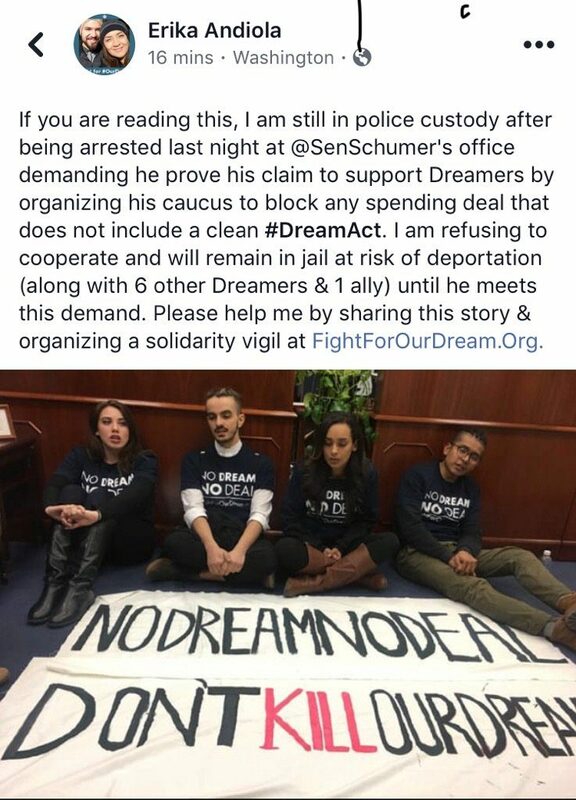 A group of seven DACA recipients calling themselves the #DREAM7, along with another protester, have refused to give their names and fingerprints to authorities after being arrested while staging a “sit-in” last Friday at the Washington, D.C., offices of Democratic Sen. Charles Schumer of New York and Republican Rep. Carlos Curbelo of Florida. 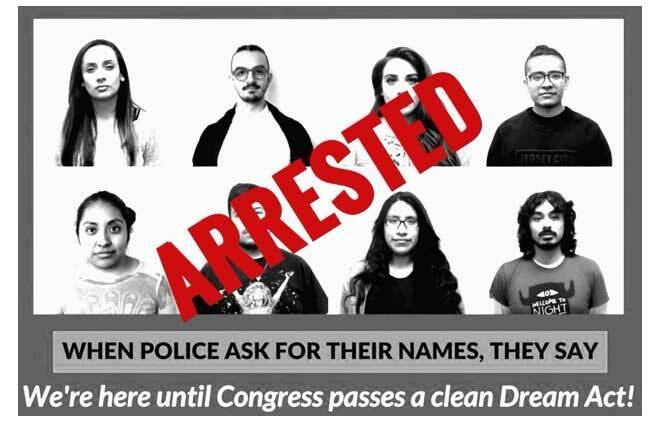 Since their arrest, these self-described ‘DREAMers’ have allegedly gone on a hunger strike and refused to cooperate with law enforcement until an amnesty bill is passed a part of a spending deal to fund the government. The illegal aliens apparently planned their arrest ahead of time, with one even announcing her intentions in an online video. It’s unclear if Immigration and Customs Enforcement (ICE) have lodged any detainers for the DACA recipients arrested, but now that they are facing criminal charges, Matt O’Brien FAIR’s Director of Research and former Assistant Chief Counsel with ICE says it could be a matter of time. Curbelo has repeatedly said he will not support any type of spending bill in the House of Representatives unless it contains a DACA amnesty. There are reports that Schumer, on the other hand, may be backing away from threatening a government shutdown over DACA. Senate Majority Whip John Cornyn (R-Texas) has said that a DACA deal wouldn’t be part of a spending bill. Try 50 million illegals.. not 11 million that are here.. That is a 6th of our country overrun with illegal entrants who have only the goal to take over for Mexico. Not assimilate into American culture. 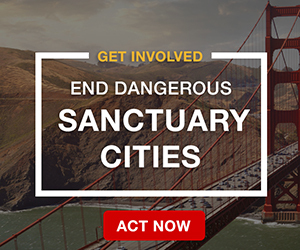 And they are quite adept at making sanctuary cities look like third world Mexico. Where are the dreams of the American people in this? It is a nightmare while they demand the sugarplum faeries in their dreams. And expect us to pay for the ride. Yes. What every the government says the number is, multiply that number by at least 4. The government says there are 11 million illeglas x 4 = 44 million are really here. Go to any public school in the poor part of your town = all illegal alien children and zero American children. Deport these Trouble Makers. Even if some of them stay. We don’t want or need any problems imported. We have enough home grown problems without these ungreatful idiots. This is why the last thing in the world we need is a “clean” DACA amnesty. The ONLY way this should be allowed is to couple it with an end to chain migration, no relatives eligible, a border wall, and e-verify for every job. Because it’s not JUST the 800,000 figure put forward [and very likely twice that or more], it’s all the many many relatives these people will eventually be able to bring in. 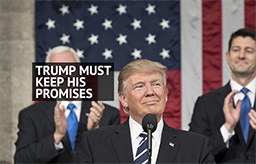 EVERY time we have had an amnesty, it’s always with promises that we will have enforcement in the future, which NEVER happens. The answer should be no, no and no. Because it’s the other side that can’t be trusted. Chuck Schumer was the leader in the House for the 1986 amnesty, and he promised it would be a “one time” deal. He lied, they always lie. Not to mention, the new tax reform bill is going to increase the deductions and child tax credits for low income workers. In other words, the exact same under-educated low-skilled people who are flooding this country under “family reunification”. The other side always makes these nebulous arguments about how “they pay taxes”. 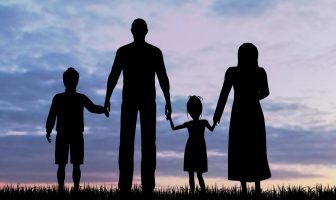 But they and their large families do not come close to what they will cost the local, state, and federal governments over many decades. They are a massive tax drain, not a help. so true!! They didn’t apply fot CITIZENSHIP because they would lose bennies and would have to pay for it themselves!!! I’m SO TIRED OF OUR GOVERNMENT GIVING NON-CITIZENS MONEY AND HELP!!! BUT WON’T HELP WE THE AMERICANS!!!! And Congress has just helped the illegals again with their new tax bill. After it is in play, every illegal family (millions & millions) with anchor babies can file income tax, claim the vastly increased credit for every snchor baby and get huge refunds. These people are not citizens, but illegals aliens that should not even be in our country, but they are much more important to our government and liberal citizens than Americssn citizens are. 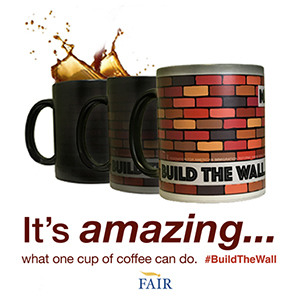 I just read that border patrol caught over 7000 illegals last month so it is reving up again. Just how many people does congressbexpect this nation to support?? Are we to take in the world and lose our country as ss result?? Does the world really need a another third world cesspit?? It’s better for them to give their names, etc. ; to cooperate, because without names and fingerprints, ICE has seven nobodies, like having seven illegal aliens from outer space, it’ll be easy for ICE to put them in a plane to mexico. My humble opinion. deport every single one of the illegal aliens….. no such thing as dreamers, daca, undocumented…. they are ALL illegals who have broken our immigration laws….. Send them back they are not cooperating with the police.police have more important things to be doing they are illegals deport what’s the problem ? ?most of these illegal immigrants been here long enough to have their paper work to get their documentation to become legal citizens. still want to give the DACA people (not kids anymore) AMNESTY!!!!! To call them “dreamers ” and Congress traitorous proposal the “dream act” is zz slsp in the face of every patriotic American.